Therefore it is recommended to delay (“defer”) the loading of non-critical files until the browser is done rendering the page. This requires adjustments to the HTML source of a page itself, as well as intimate knowledge of which file is required at what point during the rendering process. Sounds tricky? It sure is! Like many of PageSpeed Insights’ suggestions, this one is quite generic, and can be hard to implement—even with a streamlined plugin like WP Rocket! By enabling these options you may see an improvement in your performance grade on GTmetrix, Pingdom Tools, and Google PageSpeed Insights. Results will vary from site to site. Always remember to test the effect on the speed of your site. Heads up! The critical CSS tool does not yet generate mobile-specific CSS. If you have a responsive theme, the critical CSS should be mostly the same, but if you have a separate mobile theme we cannot generate the CSS for that yet. WP Rocket makes it as convenient as possible to handle advanced performance optimizations like asynchronous CSS and critical CSS. 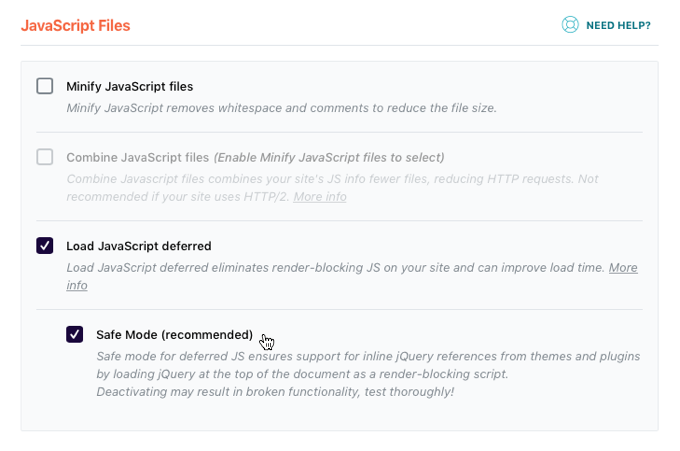 When you activate the Optimize CSS delivery setting checkbox, critical CSS will be generated for your website in the background, and added upon the next page load. After that, CSS will be loaded asynchronously on your site. Our external tool will fetch the first entry of each public post type (posts, pages, products etc. ), as well as public taxonomy archive pages (categories, tags, product categories etc.). 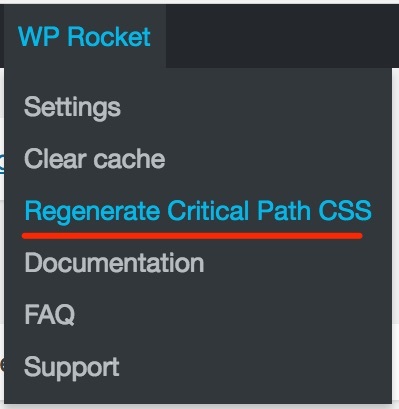 It will extract critical CSS for each of those page types separately, and send the code back to the WP Rocket plugin which will then add it to the respective pages as they are requested by a visitor, or the WP Rocket cache preloader. Relative paths in images and fonts will be automatically changed to absolute URLs. Critical CSS will be trimmed and minified with care. This means any required spaces (like inside of calc() operations) or backslashes (like '\f311' for a glyph in an icon font) will be preserved. Thus, critical CSS generated by WP Rocket adheres to front-end features available on different types of pages on your website. For example, if there’s a slider on your front page, the critical CSS for that page will reflect that feature, while critical CSS for a blog post may contain slightly different code. Your site must be publicly accessible for the tool to work, that means it won't work for locally hosted sites or sites blocked from the public by htaccess authentication, "maintenance mode" plugins or similar. WP-cron or a real server-side cron job must be able to run. 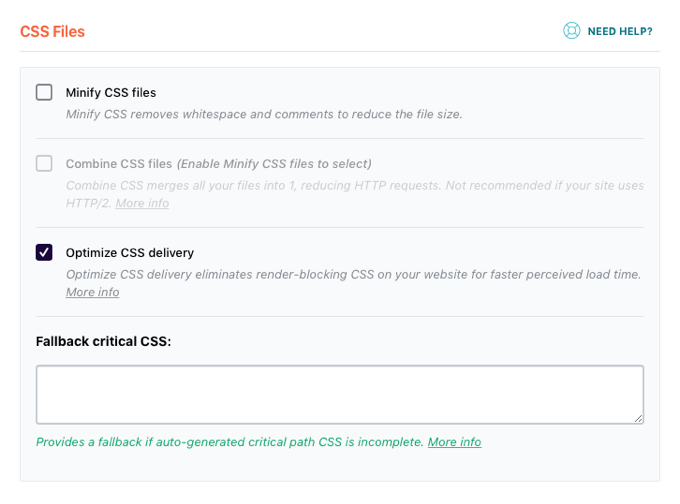 If it’s not possible for our tool to generate the critical path CSS for any content type on your site, you will see a notice with the details. Some errors can be temporary, so it’s worth trying the generation again. If the issues persist, please proceed with the troubleshooting below. If you get any error message on every content type (see screenshot below as an example), it’s likely our tool is being blocked by your site. Please make sure your site is publicly accessible and our IP addresses have been whitelisted in any security plugin or firewall. Visit the problematic URLs to check if they are valid pages. Our external tool sends a request to a page on your site. If it does not receive a 200 “OK” response, you will see an error with the response. A security layer on your site is blocking access - this often results in a 400 or 403 error. This error notice will display the specific URL(s) that the tool cannot access. Visit the URL in your browser to ensure it’s accessible. If it is, it’s likely being blocked by a security firewall or plugin, so please whitelist our IPs. If the URL results in a 404 error, or any other error prevents it displaying in your browser, that means our tool will not be able to reach it either. Resolve the issue with that page and try the generation again. If it’s for a post type that has not been declared to be public, it will not work. Some post types are not designed to be visible on the front end of your website. For example, post types that manage affiliate links. A post type may be used to manage each link, but they are not viewable as a webpage since they redirect elsewhere. There aren’t any stylesheets added within <link> tags. There’s only Inline CSS on your site. The tool does not use existing inline CSS when generating the critical path since it could result in duplicated CSS. One of the recovered style sheets is invalid, preventing the generation of the critical path CSS. Check that your stylesheets are valid and accessible. Sometimes this error can be temporary, try it again. The SSL certificate of the website is not valid so our service cannot access it. The port (80 or 443) is not open on the destination machine. The port (80 or 443) is open on the server, but its backlog of pending connections is full. A firewall is blocking access. If there are more than 2 redirects when accessing a given page, the connection is interrupted to avoid loops. If the duration between the request and the first byte (TTFB "Time To First Byte") exceeds 20 seconds the connection will be closed. Our tool was unable access the requested page. Wait a few minutes, then try the generation again. Unable to generate the critical path. The service may be overloaded. Please try again later. When several Timeouts follow each other, this can cause an overload of the queue and cause our generator to crash. When this happens, the queue is then purged. Websites that were in the queue receive this error. You may prevent any automatic generation of critical CSS by installing the following helper plugin. 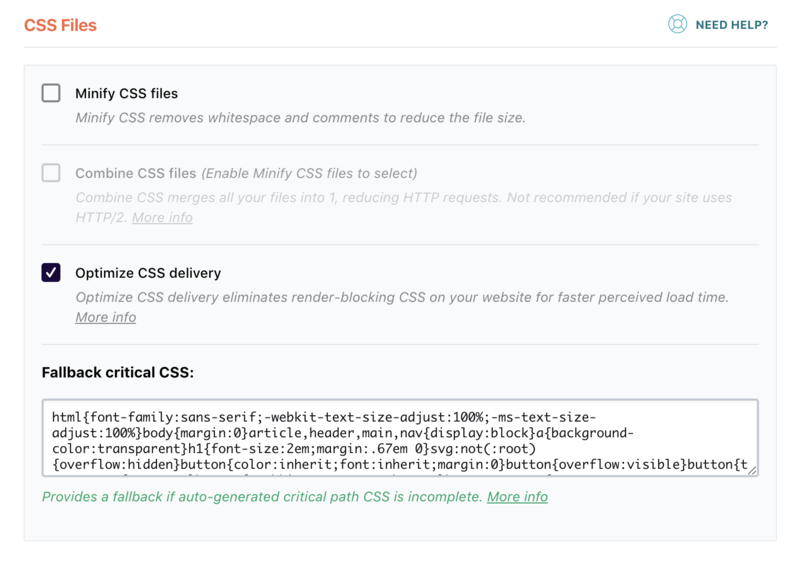 Use the tool to automatically generate critical CSS for your site. Disable automatic generation in the future by adding the helper plugin above. If you are a developer and understand CSS, you may edit those directly. Turn off WP Rocket before you start using the tool! Heads up! You may have to edit any relative URLs in the code (e.g. for background images, fonts etc.) and turn them into absolute URLs manually. Delete any existing files in the /wp-content/cache/critical-css/1 folder.